Phone: 0135 – 2698896, 2698880, 9412053459, 9412057459, 9368623664, 9368623665. Placements: It handles all aspects of campus placements for the students at JBIT, Dehradun. The office is well equipped with excellent infrastructure to support every stage of the placement process. Arrangement for Pre-Placement Talks, Interviews, and Group Discussions etc. are all handled by the Cell. Air-conditioned rooms for conducting Interviews. The placement policies and other related activities are handled by Training & Placement Officer in consultation with the Student Coordinators and Representatives. The process of contacting companies for recruitment is handled by the Placement Cell which consists of the TPO and nominated students from each department. Campus: JB Institute of Technology was established under the aegis of Jai Bhagwan Educational Society with the aim of imparting higher knowledge in Science and Technology to the aspiring boys and girls so that they can emerge as competent scientists, engineers and technologists of repute. JBIT has been established with an aim to give new direction to Engineering & professional education. JBIT is approved by AICTE, Ministry of Human Resource Development, Govt. of India and affiliated to Uttarakhand Technical University for conducting the 4 year full time B.Tech program in ME,EE,ECE,CSE,IT & CE and 3 year Full time programme in BBA & BCA . 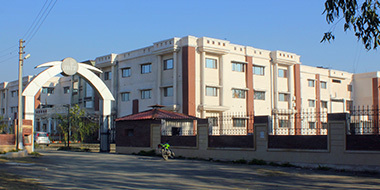 The Institute is in third year of its running. It has established all the Labs necessary for conducting the practical’s as per AICTE norms & University curriculum. All the labs & workshop have been equipped with state-of-art equipments and accessories. All necessary infrastructures are in place so as to conduct the curriculum and all other extra and co-curricular activities smoothly. Hostel: The institute has a fully fledged on campus hostel facility for boys and girls. To cater to the accommodation needs of students, the institute has boys hostel blocks with a capacity of over 500 students and a girl’s hostel block with a capacity of over 200 students. The students admit in the JBIT from all parts of the country. There are two hostels in this institute. One each of it are for boys and girls have the separate one.The hostels are in perfect shape and provide all the basic facilities to the students. Each hostel has got its own mess. Food available is delicious and the menu is decided by the students themselves.